Al-Kassar was known for his lavish lifestyle in Spain. A Syrian-born arms dealer has been sentenced to 30 years in prison for conspiring to sell millions of dollars of weapons to Colombian rebels. A New York court found Monzer al-Kassar guilty of masterminding sales of arms, including surface-to-air missiles and grenade launchers to left-wing rebels. Prosecutors said he knew Farc rebels would use them against US operations aimed at disrupting the cocaine trade. His Chilean associate Luis Felipe Moreno Godoy was sentenced to 25 years. Al-Kassar, 63, lived in Spain and was known as the "prince of Marbella" for his lavish lifestyle. During his trial, he was described as one of the world's most prolific arms dealers. He and Godoy were caught in a sting operation by undercover intelligence officers who posed as Farc contacts and filmed the operation. US District judge Jed Rakoff said al-Kassar, who was convicted in November, was a "sophisticated person," motivated by money. He said the pair agreed to sell "huge quantities of serious weapons to what they believed was a terrorist organisation who would use these weapons, amongst other things, to kill Americans and wreak havoc." In a bid for leniency from the judge, al-Kassar said he was not "against Americans, America or against any other kind of nations." He also quoted Jesus, the Koran and an old Arabic poem, Reuters news agency reported. His defence lawyers had said he was a legitimate arms dealer, and had passed on information to Spanish authorities as an informant. But Judge Rakoff called al-Kassar "a man of many faces". "It's a tragedy that a person as intelligent has spent so much of his life in activities that were certainly not calculated to advance the human race." Previously, the US Embassy in Madrid has said that since the 1970s al-Kassar sold weapons to the Palestinian Liberation Front and clients in Nicaragua, Bosnia, Croatia, Iran, Iraq and Somalia. In 2006, he was named by the Iraqi government as one of its most wanted men for allegedly helping to arm insurgents. A UN report meanwhile called him an "international embargo buster". 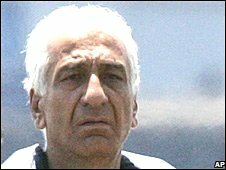 He was acquitted in 1995 of supplying arms that were used in the 1985 hijacking of the Achille Lauro cruise ship off the coast of Egypt, which resulted in the death of an American, Leon Klinghoffer.